A simple tool to help you estimate tonal range and exposure. iZoner is light meter for iPhone coming with a kit of tools for giving users accurate estimate of the lighting situation of any scene. Differently from a number of other iPhone metering apps, iZoner does not try to emulate analog meters, but it uses iPhone’s apparatus through a minimally designed and unpretentious interface. If you do not know what a light meter is, perhaps it simply means in practice you have never needed one. But even if your current camera does for you all you need to take a picture, iZoner may come in handy for understanding light and its effects on your photographs. The app’s name is inspired by the Zone System, a technique devised in the days of film photography (yes, there was such a thing as film photography and there still is) by Ansel Adams and Fred Archer as a reliable way to calculate accurate exposure. According to the system, the visual world captured by the camera can be divided into a number of tonal “zones”, ranging from pure black to pure white. The average tonal value between these extremes is set to 18% gray, which for this reason is referred to as middle gray. The color of the subject doesn’t matter, all that matters is its value. Even though the number of “zones” vary from film to digital due to specific differences in range among the two, the way the system works is the same for both. Placing all the elements in your scene carefully according to the various zones will give you a precise idea of the tonal range of the final picture also according to your camera’s possibilities and it will help you to expose it correctly. Cameras and meters assume that every scene or subject has to be rendered as middle gray for correct exposure. If you have a snowscape in front of your camera, the meter will try to render it as middle gray, causing underexposure. If you are taking a photo of a black subject (a black cat outdoors, for example) the meter will also try to render it as middle gray, overexposing it. Light meters need to be adjusted and guided for getting the exposure you want every time. Nevertheless they are invaluable instruments to help you determine the right exposure in most situations. The greatest majority of cameras today comes equipped with a built-in light meter, but film shooters or people with specific requirements can sometimes find more effective using an external light meter. In-camera light meters base their readings on reflected light, that is the light reflected by a given subject or scene. These meters give an average interpretation of the scene and, as I explained earlier, this often leads to over- or under-exposure, especially in presence of tricky lighting situations. Many hand-held meters instead base their readings on incident light, that is the light falling on a given subject, which is independent from their degree of reflectance. This is why incident light meters tend to be more accurate and reliable, but at the same time they are less practical to use. iZoner can be used as a replacement for an external light meter, an instrument that many veterans bring with them all the time, but that can be too bothersome to use and expensive to acquire for amateurs and professionals who are just starting out (light meters prices vary wildly, but you cannot expect to get a good one for less than a few hundred dollars). iZoner bases its readings on reflected light and it cannot be used effectively with incident light — which is fine, since in most cases you won’t need incident readings at all to get your exposure right. 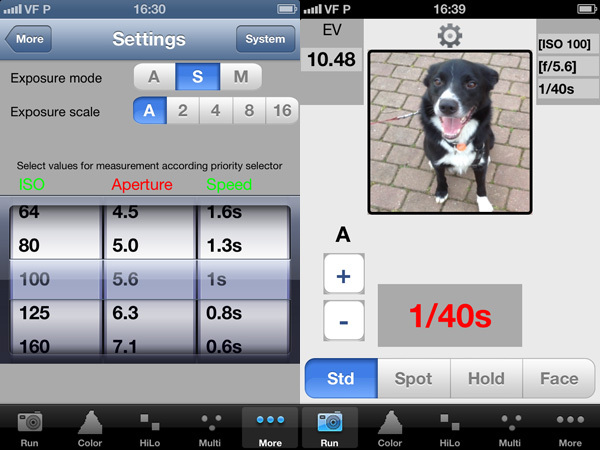 The app offers an array of metering options and tools to get accurate readings through your iDevice’s camera. 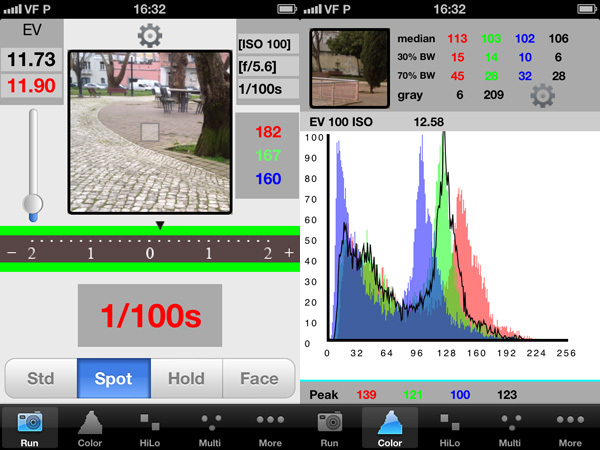 From the in-app settings, you can choose your preferred shooting mode (Aperture, Shutter and Manual) and exposure scale. Depending on your choice, you can manually determine values for Aperture, Shutter and ISO. 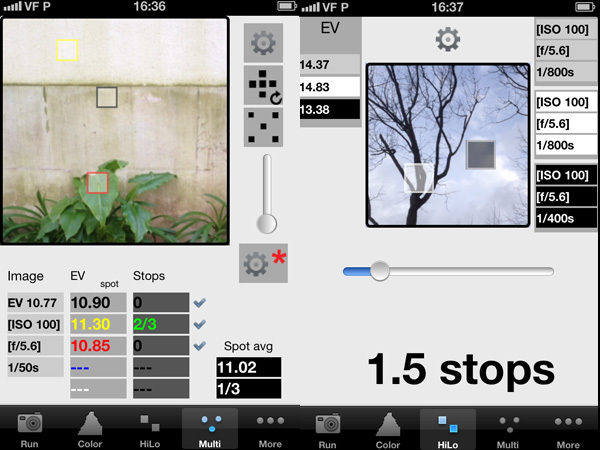 You can also change metering unit, camera offset in EV, middle gray value, and other settings. Every panel features a viewfinder and a series of informative data for helping you with exposure. Run offers several measuring modes, including a Standard mode, classic Spot metering, and Face recognition for portraits. The Run panel is the default and it’s the one you will likely use the most. For more in-depth information, you can choose one of the other metering tools. The Color panel gives you access to a real-time histogram, useful to have immediate visual representation of tonal distribution in your scene. In HiLo you have two cursors, one for metering off the darkest areas and one for the lightest of your scene. Both cursors’ size can be modified for precision. Finally, in the Multi panel you can set up to five individual spots for metering. The cursor for each spot can be placed as you like by dragging it with your finger around the viewfinder. iZoner’s readings matched perfectly the ones I got with more than one DSLR camera (I used a Canon 5D MK II and a Nikon D90 for comparisons). When readings did not match, I got better results following iZoner’s readings than the ones from the in-camera meter (which usually tended slightly towards overexposure). There are obviously instances where you cannot rely on this app, mainly in extreme low light situations and when working with studio lights. The limitations are not strictly related to the app, but they rather depend on the iPhone’s camera and on reflected light readings — don’t blame the app if you cannot get the results you want in these cases, but rather use proper incident light metering. In most lighting situations, iZoner performed very well and I would say it is reliable enough to be carried in your pocket instead of an extra piece of equipment in the form of an external light meter. The only improvements I would suggest are a new icon and splash screen — the ones the app uses now are a bit drab and may be a major turn off for some users, despite the actual merits of the app. I tried several light meter apps and iZoner is the most complete of them all. The app is probably a little complex for beginners to use right away, but it’s not hard to get the hang of after a while and it is a good replacement for the camera’s meter. 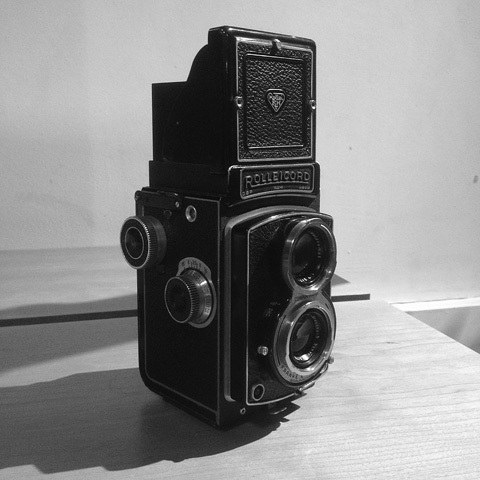 Even if you just wish to use it as an aid for your photography studies or as a support to other exposure estimation methods (the various sunny 16, etc. ), you will definitely find iZoner’s tools valuable in terms of flexibility and control. Compatibility: iOS 5.0 or later. 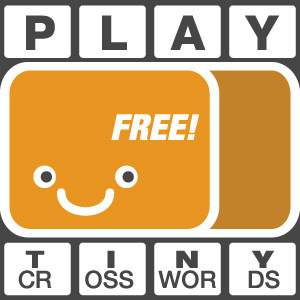 Previous post: Is It Too Early Or Too Late For Mobile Microstock?